I hate to admit it, but a lot of people are becoming forgetful these days! This fact becomes increasingly more apparent around holidays when they need to buy and ship their presents, no more so than Valentine’s Day. I forgot, for example, to ship my Valentine’s day to mom last year, of course, time slipped away from me, and all of a sudden it was February 13th! I went shopping for a last minute gift and found the perfect shirt to send to her. I knew she had to leave for work around 10:00 AM in the morning, and I wanted to make sure she received her present before leaving so she could wear it for Valentine’s day. Thankfully, Neighborhood Parcel around the corner from my house in Tewksbury MA offered FedEx overnight service with an early morning delivery through FedEx First Overnight service, by 8:30 AM to many places! I am happy to say that I shipped the shirt, and my Mom received it before she left her house. She called and she was so excited to receive her get, just in time for Valentine’s day! I could hear the smile on her face. She told me the shirt fit her perfectly and she received numerous compliments on how pretty she looked in red. It made my day to hear how happy she was on a holiday that could have been sad for her. Plus she got to brag about her awesome daughter! FedEx ships millions of gifts every year for Valentine’s Day. From flowers to candy to jewelry to baskets and everything in between, there is a service to meet your needs. 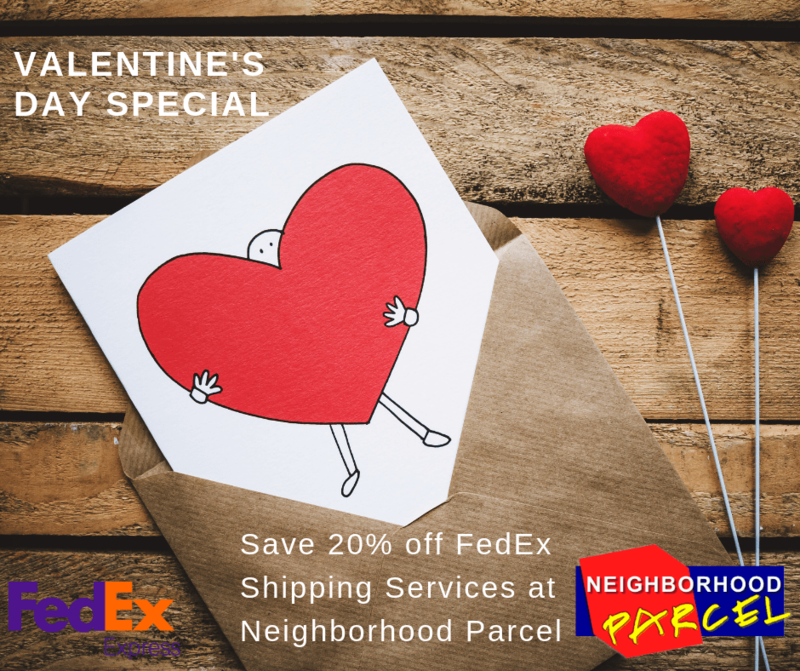 Call Neighborhood Parcel at (978)851-0199 and let them help you package and ship your next Valentine’s Day Gift. I am happy to recommend Neighborhood Parcel Shipping Center for FedEx and UPS. They helped me ship my last minute Valentine Gift to my wife who was traveling for business. Her gift was properly packaged and arrived at the Hotel as promised. I was able to track it online and she called me later that day, she was so happy and I was glad I selected the best carrier to make this last-minute gift delivered on time and saved my marriage!